Saxophone Swab - This swab has a pull string on one end with a weighted string on one side. Drop the weighted string through your bell and grab it out from the top, pulling it through. Saxophone Neck Swab - This swab has a pull string on one end with a weighted string on one side. Drop the weighted string through your neck and grab it out from the top, pulling it through. 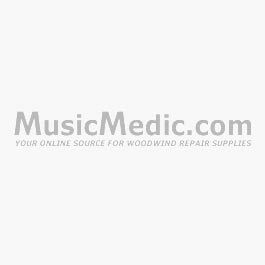 Cork Grease - Use on all cork surfaces to aid in assembling your instrument. Sax Neck Cleaner - After playing, use the brush end to remove any residue. Use the cotton end to remove any moisture. Mouthpiece Brush - Insert in the open end. Clean your mouthpiece on a weekly basis. Reed Holder - Protect your reeds in the reed holder when not playing.